If you are looking for a pool service and repair who will take the time to give you the quality of service you deserve, look no further than this award-winning company! Glenn’s Fireplace and Spa has received many overwhelmingly positive reviews across a variety of verified sites with an average rating of 4.81 stars, earning them an impressive Rating Score™ of 92.08 and a 2019 Top Rated Local award for ranking as one of the top 10 pool service and repair businesses in Michigan! It is because of excellent reviews like this that Glenn’s Fireplace and Spa is now able to call themselves a Top Rated Local award winner! We were excited to learn all about Glenn’s Fireplace and Spa, so we took the time to chat with Anthony Jaynes, service technician. We asked what helped to make their company stand out from the crowd. Anthony attributed their success to the fact that since they were a smaller company, they were able to focus on each job more personally. Glenn’s Fireplace and Spa, according to Antony, has a mission to provide quality products and service, and is able to meet these standards, in part, thanks to years of combined experience the owner and techs have. Because of this focus on the customer, Glenn’s Fireplace and Spa has gotten most of their new customers via word of mouth. 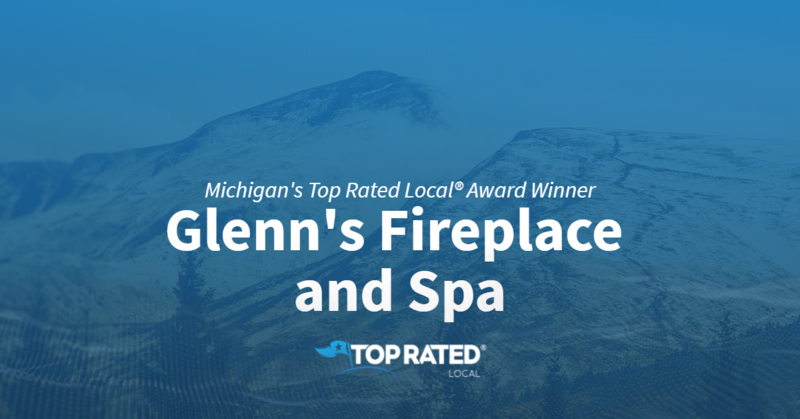 Congratulations to Glenn’s Fireplace and Spa for being a 2019 Top Rated Local award winner, and special thanks to Anthony for taking the time to speak with us!